This page is for the original release. 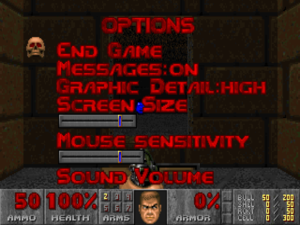 For the version included in the BFG Edition, see Doom 3: BFG Edition. Also includes Final Doom and Master Levels for Doom II. Pre-packaged with DOSBox v0.74. Includes Master Levels for Doom II. Pre-packaged with DOSBox v0.72. Unofficial commercial expansion developed by Wraith Corporation and published by WizardWorks. Not available digitally. All patches for the retail versions of Doom II: Hell on Earth (as well as Doom and Final Doom) can be found here. Edit doom2.conf and doom2m.conf with a text editor, and in the [Autoexec] section, add novert.com before the line calling the game's executable. Roland SC-55 music packs - Soundtrack for Doom II recorded on an authentic SC-55, the midi player for which the soundtrack was mixed on. Choose either OGG or FLAC; MP3 does not support proper looping. Capped at 35 FPS. For 60+ FPS, see Source ports. Edit doom2.conf and doom2m.conf with a text editor. Saves and close both files. 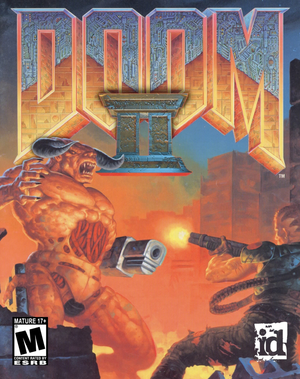 2.0, 3.3 Supported by GZDoom, Zandronum, and Doom Retro. See Source ports. A total conversion for Doom II that converts it into the PlayStation version of Doom and Final Doom while using GZDoom's modernized features. Requires Doom II and GZDoom. Follow this guide for installation instructions. ↑ 2.0 2.1 File/folder structure within this directory reflects the path(s) listed for Windows and/or Steam game data (use Wine regedit to access Windows registry paths). Games with Steam Cloud support may store data in ~/.steam/steam/userdata/<user-id>/2300/ in addition to or instead of this directory. The app ID (2300) may differ in some cases. Treat backslashes as forward slashes. See the glossary page for details. This page was last edited on 28 March 2019, at 00:05.